Buy with Confidence is an approved trader scheme which has been set up to assist residents to find reputable local businesses. The scheme is run by a partnership of local Trading Standards services. 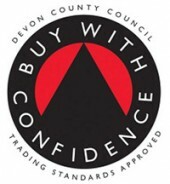 David May has been audited by Trading Standards to ensure they comply with consumer protection legislation and only once they pass can they display the Buy with Confidence logo and be entered onto the website. As an approved business we are monitored on a regular basis. Regular Feedback is also invited from our customers to ensure we trade to an excellent standard. The scheme also allows for an arbitration service in instances where the business and the consumers cannot achieve a satisfactory resolution.